Albino ferrets have a mutation in the tyrosinase gene which stops them producing pigment in their skin, fur, and eyes. Albino ferrets have white or creamy colored fur and ruby red eyes. But these distinctive looks can sometimes have repercussions for their health and temperament too! Your albino ferret is precious and unique – but of course you already know this! All ferrets are adorable, but a white ferret with transparent eyes has a color combination that is nearly guaranteed to turn heads and generate questions. In this focused article, we delve into the science of genetics and how genes combine to create the albino ferret. Read on to learn more about what an albino ferret is and what makes the albino ferret different from non-albinos. Plus, find out if there are any special health, temperament, or grooming needs that are related to albinism in ferrets. What Is an Albino Ferret? All ferrets are distantly related to weasels, otters, minks, skunks, and badgers. Today, there are two distinct modern ferret species: the domestic (pet) ferret and the wild (black-footed) ferret. The domestic ferret, Mustela putorius furo, is thought to be descended from the European polecat. There were also other later crossbreedings with related species. In contrast, the wild ferret, Mustela nigripes, is a native North American species. They recently had been endangered in the wild but are slowly making a comeback. The content in this article will focus fully on the domestic albino ferret. This ferret species is an ever-evolving product of deliberate captive breeding programs. As such, the domestic ferret is a true pet species that is unable to live in the wild. Albinism in pet ferrets is far more common than it will ever be in wild ferrets. This is because, in the wild, albinism is typically a liability. So far fewer albino animals will survive long enough to pass along their genes. But in captivity, albino animals don’t experience that liability and can live long and full lives with human companions. According to the official American Ferret Association (AFA) breed standard, there are seven distinct recognized ferret colors, and the albino ferret color is one of these. Here, the true domestic albino ferret should not be confused with the dark-eyed white domestic ferret. They have the same undercoat, guard hairs, and nose but a burgundy or dark eye color. 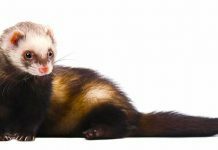 In addition to the seven recognized ferret coat colors, the AFA breed standard specifies that the domestic pet ferret can display seven different coat color patterns. One of these is the dark-eyed white coat color pattern. However, a true albino ferret will always have the solid (self or single) coat color pattern. The American Ferret Association offers this great photo of a true domestic albino ferret so you can see exactly what true albinism in a pet ferret looks like. Even true albino ferret pets can sometimes begin to appear as if the fur is more cream-colored or yellow. This may happen over time, with age, during coat molting, or after outdoor play. This apparent coat color change is caused by sun damage or by natural skin oils accumulating on the coat. These beneficial skin oils help nourish and moisturize both skin and coat and should be permitted to remain. However, in true albino ferrets, a changing coat color is never caused by the presence of pigment. 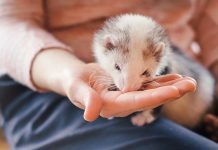 Just like with people and other modern pets, everything about your ferret’s appearance can be traced back to genetics. Albinism in ferrets is always caused by a lack of pigment in the skin, hair, and eyes. In domestic ferrets, researchers traced this lack of pigment to a mutation in a gene called tyrosinase, or TYR. Non-albino-appearing ferrets can be carriers of albinism, which is a recessive trait. This means that both parents must contribute the gene for a ferret to be born albino. This is how albino kits can be born to non-albino-appearing ferret parents. However, today many ferret breeders deliberately breed for the albino coat color. This means they are breeding two albino ferret parents to produce ferret kits with albinism. An albino parent will always pass the albino gene to its offspring. There are some possible health issues that are linked to albinism. You will want to make sure you are working with a reputable, health-focused breeder when choosing an albino kit. When it comes to temperament, both regular and albino ferrets can exhibit a variety of personality types and behavior patterns. Just like other pets and people. And like any animal or human, some of the variance relates to genetics and some to environment. season (periodic normal coat molting can cause skin discomfort and lead to more nippiness in some ferrets). However, any abrupt or extreme temperament changes may be a sign of illness or disease. If this occurs, you should always take your albino ferret to your exotic veterinarian for an immediate checkup to be sure nothing serious is brewing. The basic ferret temperament is frequently described as smart, playful, curious, lively, and adventurous. But there’s just as much variety in temperament as you would find within a litter of puppies or kittens. Some ferrets will naturally be more dominant while others will be more mellow. Some will be more outgoing and playful, while others will be calmer and more loving and clingy. Ferrets have the ability to bond closely with one or more carers. 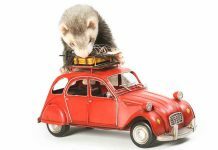 Fixed or Unfixed Pet Ferret? Ferrets that are fixed (spayed/neutered) will show less temperament differences between males and females. Unfixed adult males may be more aggressive, especially if there is an unfixed female ferret nearby that goes into heat. Therefore, you should only keep unfixed ferret pairs if breeding is a part of your plans! No evidence exists that albino ferrets have any significant personality or temperament differences that are specifically linked to the lack of pigment in their skin, coat, and eyes. But it is possible that an albino ferret may show some temperament differences due to being deaf or hard of hearing or vision impaired. 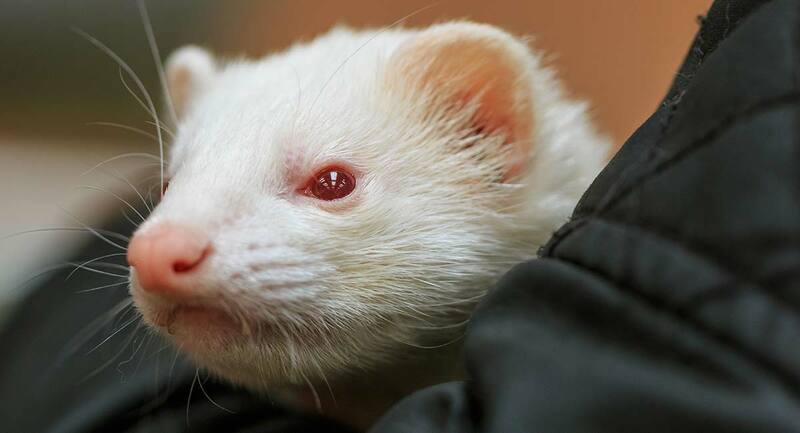 Even albino ferrets that are hearing or vision impaired can make excellent pets. Ferrets as a whole are smart, inventive pets that can readily adapt to such deficiencies. It will be important for you to do your part, as well. Make interactions easy for your ferret by not relying too heavily on sight or sound cues in training and play. The albino ferret coat color is a popular one in the ferret pet trade. The most important aspect of bringing home a quality pet albino ferret is to choose a good breeder to work with. A reputable, health-focused albino ferret breeder will ensure good health and genetic diversity in all litters. Ultimately, finding a breeder that adopts a health-first breeding approach is the number one determinant of choosing the healthiest, happiest pet albino ferret. An albino ferret may or may not develop certain known health issues that relate to albinism. Here are three of the major categories of known health issues that may be linked to albinism in ferrets. There is no doubt that vision is not a ferret’s sharpest sense. This holds true regardless of whether the ferret in question is a true albino or not. There is evidence that chronic inbreeding in the industry has further limited visual acuity in pet ferrets. However, any ferret that carries a gene for albinism can experience more visual impairment than normal-color-patterned peers. One known eye issue that is more common for albino ferrets is that they can be born cross-eyed. Sometimes these same ferrets also have trouble with visual processing. They may depend less on vision and more on other senses to navigate, feed, and get around. Researchers have also identified a genetic defect that interferes with normal ferret binocular vision. This creates a narrower range of visual perception. The lack of pigment in the iris is what causes the eyes to appear red. Instead of color, what you see is the redness of the blood vessels inside the eye. This lack of pigment contributes to light sensitivity in albino ferrets. This light sensitivity will be present both indoors and outdoors. So every effort should be made to keep the lights at a comfortable dimness for your pet. Albino ferrets inherit a higher risk of deafness. Albino ferrets can inherit congenital (present at birth) deafness. Some may inherit late-onset (later developing) deafness due to the absence of pigment in the inner ear canals. With no pigment delivery to the fine hairs of the inner ear canal, blood flow to these cells is restricted. Therefore, over time, they die off. This causes the inner ear mechanism to form abnormally. It is smaller than it would be in a normally colored ferret. So albino ferrets will potentially be deaf or hard of hearing in one or both ears, or some combination thereof. One study shows that as many as 10 percent of albino ferrets may be bilaterally deaf (deaf in both ears). Researchers believe this high incidence of genetic deafness is linked to a mutation in the TYR gene. Even for the estimated 90 percent of albino ferret pets that may not be deaf, there remains a higher likelihood that albino ferrets will not hear as well as their more colorful peers. Ferrets, like many active pets, can enjoy spending some time playing outside during nice weather. However, they have a lack of protective skin pigment. So albino ferrets will have a greater natural skin sensitivity that can predispose them to sunburn and skin cancer. Cancer is an existing concern in all ferrets regardless of coat color. Equip your albino ferret’s outdoor play area with a sun shield to lessen the risk of sunburn. Ferrets have a double-layer coat. It consists of a longer, coarser outer coat (often called guard hairs) and a softer, shorter, finer insulating undercoat. Both coat layers will shed somewhat year-round. You will see more intense shedding at the changing of the seasons or as temperatures fluctuate. This same coat molt process occurs whether a ferret is albino or not. However, albino ferrets can have more sensitive skin overall. Especially after exposure to artificial or natural ultraviolet light. So it will be important to check their skin and coat regularly to be sure it is not getting dry or irritated. Ferrets will do some amount of what is called dry scratching naturally. If this becomes excessive or you see any dry, scaly, or red patches or any skin abrasions, this may be a sign the skin is too dry. Always seek your exotic veterinarian’s guidance before deciding to bathe your albino ferret. Exposure to water can leach skin oils and cause further skin drying. We hope you have found this focused article on the albino ferret helpful and informative! Are you considering bringing an albino ferret into your family? Or are you caring for an albino ferret right now? We love to learn from our readers! Landes, R., “AFA Ferret Colors and Pattern Standards,” The American Ferret Society, 2019. Axelson, R., “Ferrets – Owning,” VCA Animal Hospital, 2009. Gustafson, K., et al., “Low genetic diversity in domestic ferrets,” Science Daily / University of Wyoming, 2017. Brown, G., “Selecting a Pet Ferret,” American Veterinary Medical Association, 2019. Garipis, N., et al., “Visual field defects in albino ferrets (Mustela putorius furo),” Elsevier, 2003. Blaszczyk, W.M., et al., “Identification of a tyrosinase (TYR) exon 4 deletion in albino ferrets (Mustela putorius furo),” Animal Genetics Journal, 2007. Livieri, T., et al., “Top 5 Differences Between Black Footed Ferrets and Pet Ferrets,” Prairie Wildlife Research, 2019. Brown, S., “Grooming Ferrets,” Veterinary Partner, 2011. Strain, G.M., “The genetics of deafness in domestic animals,” Frontiers in Veterinary Science, 2015. Previous articleHolland Lop – Is This Little Lop Eared Bunny Your Perfect Pet?